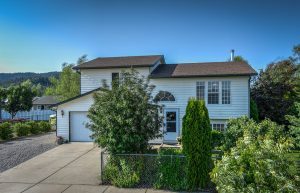 This great 4BR/2BA Rathdrum home sits on a large .24 acre lot with RV parking. Offering an open floor plan, vaulted ceilings, gas fireplace for your comfort, stainless steel appliances plus a pantry. Relax in your park-like back yard with gorgeous mature landscaping providing your own cherries, grapes, raspberries, blueberries and apples. The garden area, garden shed, RV parking and mountain views make this home ready for your enjoyment.